The first step is to go the 'standard CMOS' setup screen and note again the IDE devices that are attached to your computer. If you have the option, you can also go to 'auto-detect IDE settings' which will enumerate all hard drives and optical drives for you. Following this, there are a couple of other areas that may be of interest: 'CPU PnP setup' may contain details of the processor type and speed. 'Chipset setup' may contain details about the speed of your AGP (video) slot. 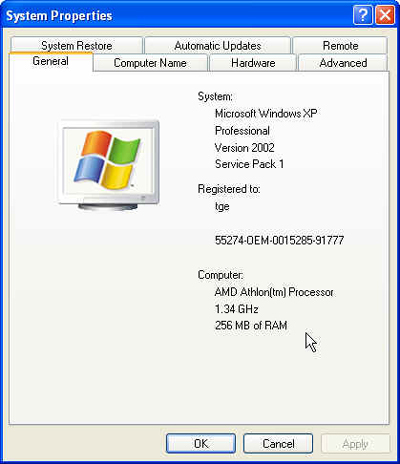 In most Windows operating systems, there are two useful locations for collecting information about your system, the 'my computer' properties screen, and the Device Manager. To get to the 'my computer' properties screen, simply right-click the 'my computer' icon (on the desktop in 9x/ME/2000 and the start menu in XP) and hit 'properties. In the above example, (Windows XP), you can see we have the amount of installed memory, and the type and speed of the CPU. WindowsXP is rather more helpful in this respect than most other versions of Windows, but all of them should give you at least a reliable account of the amount of memory you have installed.